On Feb. 1, the snow stopped and the sky just cleared just long enough for a perfect - if not brisk day for the Mid-Winter Classic 10-miler in Cape Elizabeth. Nearly 700 runners finished the event .It was won by Adam Goode, a 31-year-old from Bangor, who finished in 53:21. He juggles 70 to 80-mile training weeks between his jobs as a coach, social worker, a fourth-term member of the Maine legislature, and above all, bass player in the band Chamberlain. We recently caught up with Goode to talk to him about how training, his racing, and how he does it all. 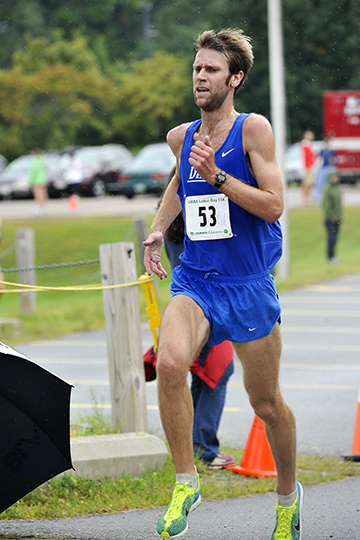 His finishing time was one minute off his PR for the distance - a 52:46 in the 2014 Tour Du Lac 10-miler in Bucksport, but more than a minute faster than the last time he finished the race - in 2008. I serve in the Maine House of Representatives. I’m serving my fourth term, and I represent part of the west side of Bangor. I am also the Head Cross Country Coach at Bangor High School and I am a social worker. I’m training for... the New Bedford Half Marathon in March, and the Boston Marathon in April. The biggest obstacle in training is…. Rest. It is harder for me to take time off and rest than to get training in. I have always been a morning person, so usually I just run first thing when I wake up in the morning. I take a day off about once a month. I take a week off a few times during the year. Did you run growing up? I ran at Bangor High School and the University of Maine. In high school I enjoyed cross country the most and probably did best at the 2 mile. In college I ran the 3,000 and 5,000. The highlights of my running career include... I have a few: Seeing the high school cross country students really enjoy running, running on a relay team that competes at the Cabot Trail Relay, which we have won a few times, and top 25 finishes at the 2012 and 2013 Houston Marathon. (I placed 23rd in 2012 and 22nd in 2013, where my sister and friends were cheering me on. How do you keep your training on track through the winter? Running early in the morning helps deal with some of the messy roads. There is much less traffic then, so that helps in finding a clear place to run. There is a new field house at the University of Maine, so I get up there from time to time. I'll run on the treadmill if it is snowing hard or icy. I think being able to be patient and zone out are important skills to have and running on a treadmill is great practice for that. I'm also less picky about getting in specific workouts on specific days in the winter, so I just play it by ear more. What advice would you give to someone about how to get fitter and faster? I have met some of my best friends through running. If you have good relationships with people that you know through running, I think you will be more likely to meet your goals.